BXL Cellular Cleansing Solution instantly decongests and refreshes skin with purifying 100% natural botanical extracts, without taking away anything morethan is good for you. 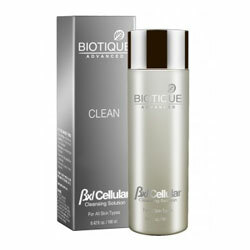 This non-soap, non-alkaline lotion dissolves makeup and other impurities. Powered by exclusive BXL Complex for the most energizing, nourishing and strengthening skin effects. Apply to cotton pads or wash cloth. Gently wipe over face and neck, AM and PM.